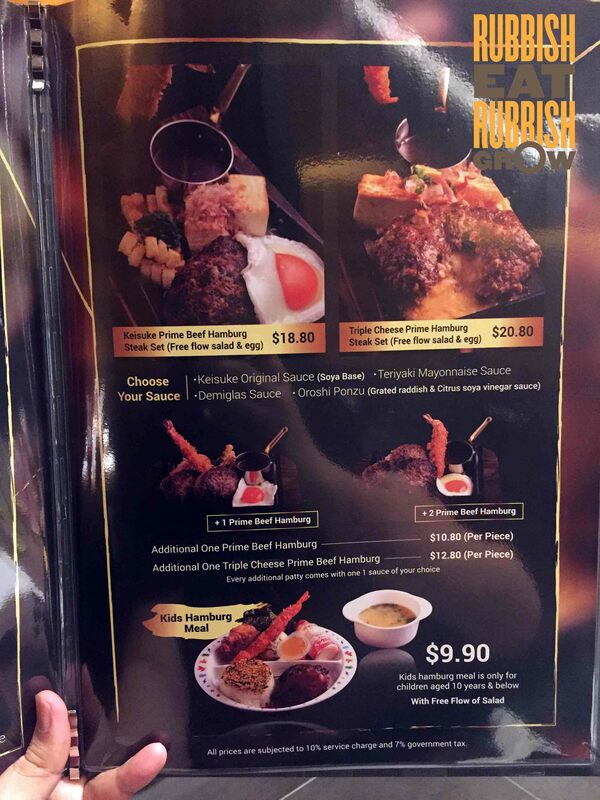 Teppanyaki Hamburg Nihonbashi Keisuke Bettei at Tanjong Pagar–the shop name is a mouthful, and like the name, you’ll want to get a mouthful of this. I make it no secret that my favorite ramen shops and my favorite tendon shop are from the Keisuke group, and being the fanboy that I am, I thoroughly enjoyed their hamburg restaurant, the first restaurant in Singapore to focus on hamburg. Forgive me if I sound overly enthusiastic in this review. Every customer must order 1 set of hamburg–no sharing–because there is a salad bar buffet and free-flow of eggs. After you order your meal and while waiting for your hamburg to come, go and take from the salad bar stocked with 20 items. So many items that my camera couldn’t capture the end of the salad bar. Anyone who goes grocery-shopping will know that these 20 items at the salad bar are not cheap. There are whole cherry tomatoes and pumpkin. My favorites are the carb-based salads (that’s why I’m fat): cha soba salad, mac salad, ramen salad, and pasta tuna salad. By the way, they have desserts at the salad bar. It’s mostly fruits (watermelon, orange, and pineapple), but they also have a coffee jelly. The older generation will remember this. Japanese restaurants used to serve coffee jelly at the end of the meal, but this dessert has “disappeared” for the past few years. You can say it’s a long-lost tradition. 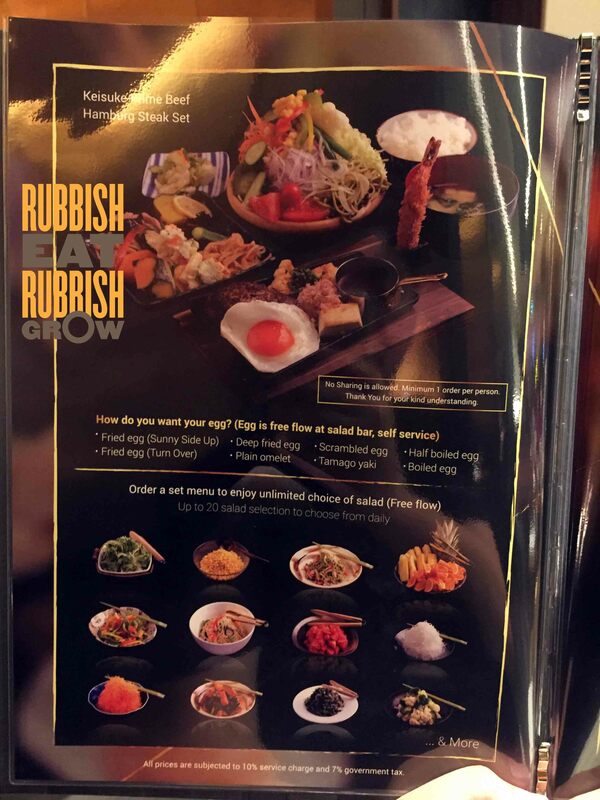 Besides the salad bar, there is also a live station serving eggs of all styles: sunny sideup, overeasy, boiled, scrambled, half-boiled, omelette, and tamago yaki. Well, poached is missing, but you may request from the chef. A note on the eggs: they are freshly supplied by a Singapore local farm daily. #supportlocal and reduce carbon footprints. So how much do you have to pay for the salad bar and free-flow of eggs? You only need to buy a hamburg set! They currently have only two sets: Prime Beef Hamburg Set ($18.80++) and Triple Cheese Prime Beef Hamburg Set ($20.80++). Both sets contain 150g of prime US beef shoulder that is chopped into two sizes to give a nice bite and texture. The beef is then formed by hand into patties. The main difference is that one has cheese, and one doesn’t. Each set comes with an ebi furai (fried prawn), fried beancurd, tofu, (refillable) rice, miso soup, and a choice of sauces. There are 4 sauces: Keisuke original sweet-and-spicy sauce, demi-glace, oroshi ponzu (radish with vinegar), and teriyaki. We didn’t like the Keisuke sauce, which has a bitter ending, and we didn’t like the oroshi ponzu with a weird muskiness. Just go for the classic demi-glace or teriyaki sauce. Between the normal and the cheese hamburg, go for the latter. It is stuffed with 3 types of cheeses, cheddar, mozzarella, and parmesan. My preference for cheese is towards the heavy, but here the cheese taste isn’t strong. Still it adds an interesting spin to hamburg. The group behind Keisuke ramen is opening a hamburg restaurant with a salad bar buffet. This 180g prime US beef shoulder patty has a mix of 3 cheeses, cheddar, mozzarella, and parmesan. Opens Monday! It is not enough to have an original concept, it must be executed well. And Keisuke group does it excellently. At the end of the tasting, I was given vouchers to return and yes, I’ll definitely go back. As I’m typing this, I’m getting excited for my next visit. I can’t wait! This time, just eat, enjoy, and don’t need to take notes and photos. Opens 13 Mar 2017, Monday. I have never seen eggs done like that before? They look like treats haha.